Camalie Networks is the wireless sensor networking enterprise of Camalie Vineyards. Our mission is to provide grape growers with advanced irrigation information technology to help them optimize grape quality and yield while minimizing water use, pumping energy and risks like irrigation system failure and frost. Camalie Vineyards has been Crossbow's field test site since early 2005 when it began its eKo Pro product development. Since then two generations of prototypes and the eKo Pro Series product itself have been used under demanding field conditions to provide data for irrigation decisions at Camalie Vineyards, a Mount Veeder appellation Cabernet Sauvignon vineyard on the western slopes of Napa Valley. Camalie Vineyards has been using wireless soil moisture sensing technology since 2003 to make irrigation decisions and has used this experience in cooperation with Crossbow to optimize the eKo Pro system. Camalie Networks was started in early 2008 to provide this capability to growers in Napa and the California North Coast Region. Mark Holler is founder of Camalie Networks and Viticulturist at Camalie Vineyards. A device physicist, Neural Network developer and Human Interface Researcher during a 25 year career at Intel Corp. he developed rapid technology learning skills which have allowed him to apply knowledge from one domain to solve problems innovatively in other domains, in this case viticulture. Cofounder Cynthia Bickerstaff brings extensive experience in measurement, statistics and data analysis from 15 years as a process development engineer at Intel. She also brings 10 years of networking experience at Intel Online Services and Intel corporate IT where she was responsible for measuring and optimizing network performance worldwide. To the right is son Cameron who is our chief installation assistant. Dr. Alan Broad joined the Camalie Networks team in the Spring of 2011 bringing with him the most complete knowledge of the eKo Pro system and its firmware. Alan was Chief Technology Officer at Crossbow and was responsible for development of the eKo Pro system from its inception. Since joining Camalie Networks he has enhanced the eKo Pro node firmware to support water meters and Valve Actuation and designed the CN101 interface module which provides the electrical and data interface between eKo Pro and these two devices. Giving eKo Pro the ability to take action, opening/closing valves based on data it is monitoring has more than doubled the utility of the system. Camalie vineyards, the development test site for eKo Pro, currently has one of the most advanced soil moisture monitoring systems in operation in U.S. agriculture today. It uses the wireless sensor networking technology developed by researchers at UC Berkeley in collaboration with Intel Corp and commercialized by Crossbow Inc and more recently Memsic Inc. as eKo Pro. It is used for optimization of irrigation; reducing water consumption and associated pumping energy costs as well as increasing grape quality without sacrificing yield. It also serves as a monitor of the irrigation system, failure of which can cause substantial long term impact on the large capital investment in the vines. 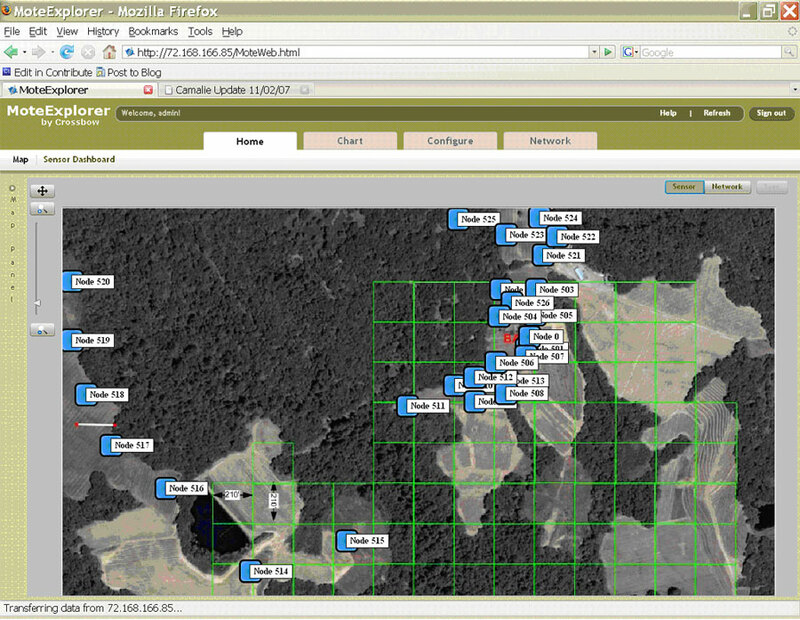 This monitoring system provides both information useful in making irrigation decisons and a form of risk management. Mark Holler, owner of Camalie Vineyards, developed interface circuitry and adapted Crossbow hardware and associated TinyOS firmware for the Watermark soil moisture tensiometer, soil temperature probe and water pressure sensors used in the first version of this system which was deployed in the summer of 2005. Mark is also the grower who looks at the data and makes the irrigation decisions for Camalie Vineyards and Konrad Vineyards. Ramon Pulido founder of Pulido Vineyard Management, is the vineyard manager for Camalie Vineyards and other vineyards on Mt. Veeder. His company brings many years of growing experience to growing grapes on Mt. Veeder. He manages all of the cultural practices, spraying for powdery mildew, irrigation and erosion control using cover crops in the vineyards. He is a convert. Said of wireless sensing, "I wouldn't grow grapes with out it now". Soil moisture sensing began at Camalie Vineyards in 2003 using a Davis weather station with three Watermark Sensors. This data was found to be quite useful but, it was clear data from other irrigation blocks was needed to irrigate optimally in them as well. The lack of a scalable solution to gather data from more locations was the driving force behind the development of the wireless sensor network at Camalie Vineyards. Prototype networks were used during the 2005, 2006 and 2007 growing seasons to guide irrigation decisions in the 4.4 acres of Camalie Vineyards. Yield per vine in 2005 was double that of the 2004 yields for same age vines yet water consumption was constant. Water consumption normally goes up with canopy size which more than doubled for these 2.5 year old vines in 2005. Grape quality was excellent. Some of this success was due to generally better than average weather in 2005 but, we believe our visibility of the soil moisture played a significant role. Extra drippers were added to some areas of the vineyard based on the soil moisture data. Also irrigation intervals were shortened based on sensor data to reduce the amount of water that penetrated below the root zones where it would be wasted. In 2006, the third year of production for the vines, the yields again doubled from 4 tons to 8 tons. In the 4th year, 2007 the yield again doubled to 17.5 tons. The yield was 3.97 tons per acre which is very rare on Mt. Veeder especially with water limited due to less than half the normal rainfall in the winter of 06/07. Water had to be purchased but thanks to our precision irrigation we minimized water purchasing and still had great yields. Fruit quality was again excellent although early rains near harvest bloated some of the first fruit harvested, reducing Brix levels to the 25-26 range. Some of the last fruit harvested after a week or two of dry weather, however, had a late in the day Brix average of 29.7! At the end of the 2007 growing season the network was upgraded from 433MHz prototypes which use Crossbow mica2dot radios to eKo Pro series alpha units opperating in the 2.4GHz band. The network was scaled up at this time from 10 sensing sites in one vineyard to 17 sites covering Camalie Vineyards and Konrad Vineyards. On March 3, 2008 it was scaled up again to 30 sites. As the cliche goes, when you have a hammer everything looks like a nail. Along this line Camalie Networks developed a prototype system to monitor fermentations using some 433MHz stations from the vineyard that had been decommissioned. The results of this Fermentation Monitoring during the 2007 crush demonstrated that the wireless networking technology can be rapidly adapted to other environments which can benefit from web based monitoring. As Holler likes to say "Wireless sensor networks extend the internet out into the environment". Camalie Vineyards Case Study in Crossbow Mote Deployment Powerpoint presentation for Crossbow user's group 4/11/06 Report on 2005 season results. Last modified: 1/8/14 M.H. Note on pronunciation: Camalie rhymes with "family"